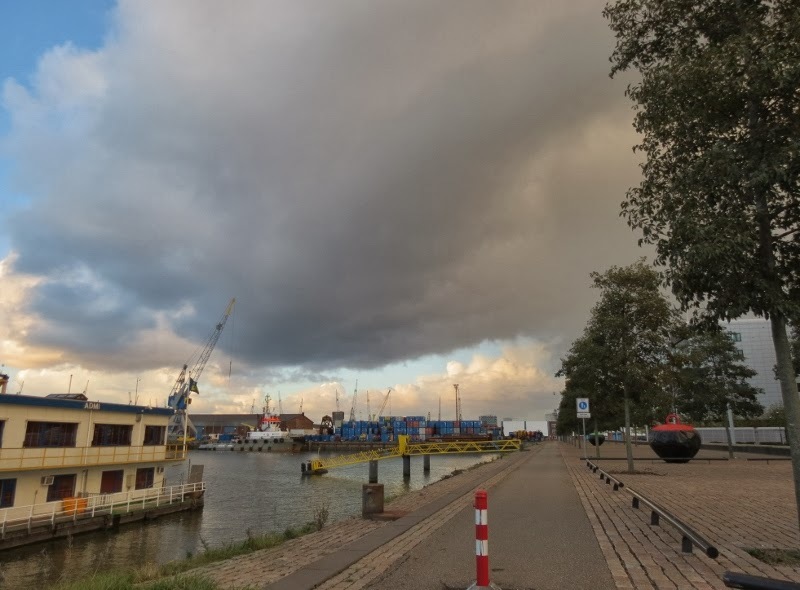 A selection of recent severe weather events in the low countries; like supercells, waterspouts and funnels/tornadoes. Visiting a museum in Hellevoetsluis several spouttype funnels (probably full blown waterspouts on the 'Brielse Meer) were seen to the Northwest. In the evening after a walk near the 'Rhoonse Grienden' I saw the beginning of what was to become a long living spouttype funnel. I came closeby on the edge of Spijkenisse. Below a short video of the chase. Mostly september showed some interesting convection. Some pictures still needed to be shown here! Some examples of convection I did see on april 25, may 9, 10, 22 and 23. Early winter convection; a line of interesting cells. The warmest 'third of Januar' since the Dutch temperature measurements started (AD 1901) was followed by the passing by of a line of TSTMS. Some of them were suspect of having rotational updrafts. A week after the tornadic supercells another surprise was in store. This Sunday a trough with temps of -30 C at the 500 Hpasc. level passed the Netherlands bringing some storms. There were no chances for real severe weather events, although I wouldn't have been surprised to see a landspout. 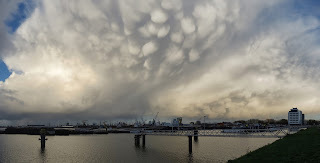 Great was the mammatus display at around 16 hrs. LT.
(Unlike the Sunday before I did'nt want to miss the 17 hrs. church service to see even 'more of heaven' overthere ;) ; so I somewhat had to hurry). I was glad I had chosen the right position and the CB took the right position in front of me. The CB by the way had a beautiful 'Rain Free Base'; but cells of the 'last week Sunday kind' were shearwise not possible. Welcome on my blog. Hope you enjoy watching and reading. On this blog I give an eye- witness account of severe convective weather events. All text and every photo placed on this blog can't be used without my written permission. Married since 2000, 4 kids (2006,2008,2011, 2016). When a thunderstorm has a longer living rotating updraft (mesocyclone) we call it a 'supercell'. A supercell is a relatively rare appearence in Holland; only on a few days a year one or more can be spotted. They can only exist under specific wind conditions. The top of the storm is often not that heigh as that of their bigger brothers in eg. the US. They often bring extreme weather with large hail and even tornado's being possible. A so called 'wallcloud' is a lowering under the stormcloud out of which a tornado can form. The last photo from the 1st of October 2006 shows a wall cloud. Another type of tornado is not associated with a mesocyclone. It can appear below a stormbase when there are less windy conditions. Although relatively seldom they appear more often than the 'real' tornado. I prefer to call them 'spouts'. Other weatherphenomena I'm interested in are 'shelfclouds' and 'mammatus' clouds.